Redmi 5A Charging Ways Charging Solution Not Charging Problem USB Ways Charging Jumper Charging Short In this post, I will guide you on how to troubleshoot Redmi 5A charging Problem or won’t respond when connected to a charger. So, if you are currently having this problem, continue reading to learn the steps to rule out possibilities to discover what the problem with your phone really is. Many users who have bought the high-end Redmi 5a are facing the problem of Redmi 5A not charging issue. Most of the smartphones are functioning correctly but some of the users complained about the problem of Redmi 5A not charging correctly. Some of the Redmi 5A owners thought that the problem was with the charger and they bought new chargers but after that, they realized the problem was not in the charger. In this tutorial, we will suggest you some quick solutions to Xiaomi Redmi 5A not charging issues. So if you are experiencing any charging problem or problem connecting your Redmi 5A to your computer via USB cable then it is possible that your Redmi 5A charging connector is faulty. Replacing it with a new one is the only solution here. But if by any chance the USB connector prints are broken then you have to make the jumpers as shown in the diagram below. 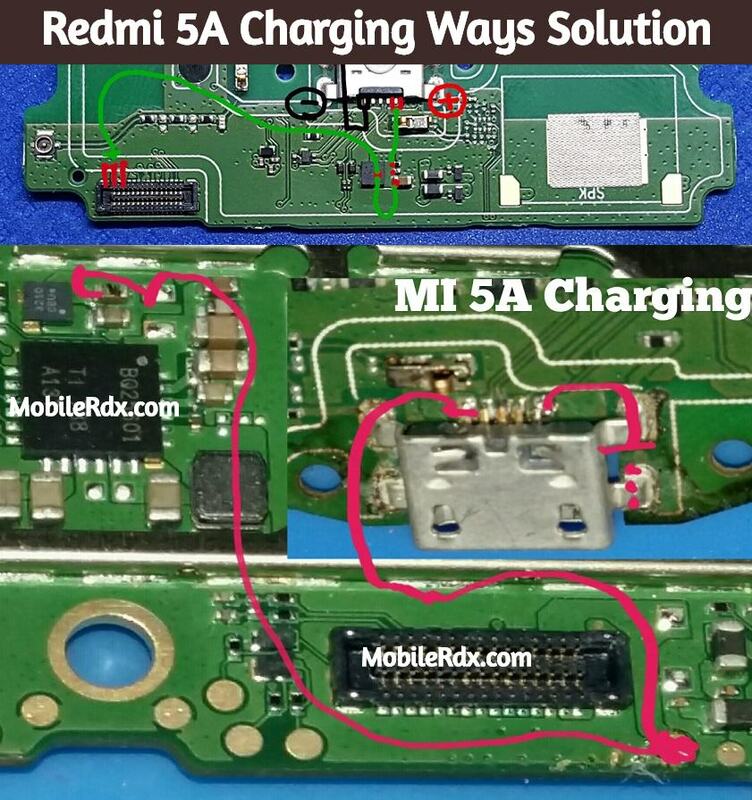 Here are Redmi 5A Charging ways problem solutions. Please study these diagrams very carefully before you start repairing.